Olympus M.ZUIKO DIGITAL ED 75mm f/1.8 review: Is this the best Micro Four Thirds lens available? It’s been over four years since Olympus and Panasonic jointly announced their Hybrid Mirrorless Camera venture in 2008 and the Micro Four Thirds lens mount was born. Since then the growing number of Micro Four Thirds lenses available has started to turn the system into a serious option for more and more photographers. Olympus alone has 12 Micro Four Thirds lenses available covering a 9-300mm focal range, equivalent to 18-600mm in 35mm terms, including specialist options such as slim line pancake lenses, macro and portraiture primes, as well as a range of zooms. A recent release is the Olympus M.ZUIKO DIGITAL ED 75mm f/1.8 prime lens announced in February 2012, which is an attractive proposition for photographers looking after a high-end ‘fast’ prime for studio, portrait or even sports photography. Taking into account the x2 ‘crop factor’ on the Micro Four Thirds system the equivalent focal length translates to 150mm in 35mm terms making it a long telephoto option – something to bear in mind if you’re planning portraits in the studio or environments with restricted space. Sporting a full metal housing, solid construction and all silver finish it certainly looks and feels the part but costing $899 it’s not cheap. You don’t even get a lens hood supplied as standard so budget another $75 if you want one of those! 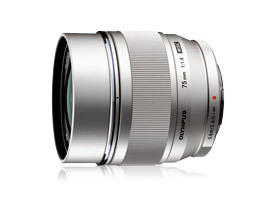 So if you’re after a ‘fast’ telephoto prime is the Olympus M.ZUIKO DIGITAL ED 75mm f/1.8 worth the money? For the purposes of this review all Lens Metric Scores have been achieved with the Olympus M.ZUIKO DIGITAL ED 75mm f/1.8 lens mounted on the 16-megapixel Panasonic GH2, which was the highest resolution Micro Four Thirds camera available at the time of testing. Measurements with the lens mounted on the Olympus OM-D EM-5 will be available shortly. Achieving an Overall DxOMark Score of 23 the Olympus M.ZUIKO DIGITAL ED 75mm f/1.8 prime is the highest scoring lens currently on the DxOMark database for the Micro Four Thirds mount. As you’d hope with a prime optically it performs well with no noticeable Distortion and no issues with Chromatic Aberration at any aperture settings. There’s some minor vignetting at the maximum aperture of f/1.8 with corner shading of 0.7EV, but this can be rectified in post-production, and stop the lens down to f/2.8 and it’s no longer an issue. Sharpness is also excellent and an Overall Lens Metric Score of 11P-Mpix makes the Olympus M.ZUIKO DIGITAL ED 75mm f/1.8 the sharpest Micro Four Thirds lens on the DxOMark Database. Scoring 11P-Mpix for Sharpness the Olympus M.ZUIKO DIGITAL ED 75mm f/1.8 telephoto prime is the sharpest Micro Four Thirds lens tested by DxOMark. If you’re considering this lens for portrait or low-light photography you’ll be encouraged by its sharpness at the wider aperture settings. At the maximum aperture of f/1.8 good sharpness is resolved in the centre of the frame and although it trails off at the edges it’s well controlled for such a wide aperture. Stop down to f/2.8 however and good sharpness becomes homogeneous across the frame and the lens’s optimum sharpness is achieved at f/5.6. Sharpness does drop off between f/11 to f/22 but generally results using these smaller apertures are less important with this type of lens. At f/1.8 good sharpness is resolved in the centre of the frame only dropping off slightly in the corners. Stop down to f/2.8 and sharpness becomes homogeneous. Olympus M.ZUIKO DIGITAL ED 75mm f/1.8 vs. Olympus M.ZUIKO DIGITAL ED 45mm f/1.8: How does Olympus’s cheaper prime compare? Although offering different focal lengths both these Olympus ‘fast’ telephoto primes are an option for portraiture or low-light photography. The Olympus M.ZUIKO DIGITAL ED 45mm f/1.8 offers a shorter focal length, which is beneficial for shooting portraits in locations where you can’t take another 3 or 4 steps back. It’s also lighter, smaller and cheaper but how does it compare optically? Well there’s nothing between the Lens Metric Scores for Transmission, Distortion or Vignetting, although the 75mm version does score marginally better for Chromatic Aberration, 2um to 4um. This is down to the 45mm displaying some minor default at f/1.8 but in the real world there’s very little between these two lenses until you look at Sharpness. A Sharpness Lens Metric Score of 9P-Mpix for the Olympus M.ZUIKO DIGITAL ED 45mm f/1.8 isn’t bad but it can’t live up to the 75mm, which is 15% sharper than the 45mm version. At the maximum aperture of f/1.8 the 75mm has the edge being sharper in all areas of the frame but particularly in the centre, although the 45mm is more homogeneous at this setting. Stop down to f/2.8 and sharpness of the 75mm really excels with good and homogeneous sharpness compared to the 45mm. The pattern continues at all aperture settings with the 75mm always just that little bit sharper and more consistent than its cheaper rival. It’s fair to say the 45mm is much sharper in the centre at f/2.8, compared to its own performance at f/1.8, but it suffers from heavy drop off in the corners at this setting. Stop down to f/2.8 and sharpness on the Olympus M.ZUIKO DIGITAL ED 75mm f/1.8 excels compared to the Olympus M.ZUIKO DIGITAL ED 45mm f/1.8 with poor sharpness in the corners. Both lenses perform their best at f/5.6 but the Olympus M.ZUIKO DIGITAL ED 45mm f/1.8 still doesn’t offer edge-to-edge sharpness at this setting, which is disappointing for a prime lens. Olympus M.ZUIKO DIGITAL ED 75mm f/1.8: An excellent lens if you can afford it. The Olympus M.ZUIKO DIGITAL ED 75mm f/1.8 is best lens DxOMark have tested for the Micro Four Thirds hybrid camera system. Available for both Olympus and Panasonic Micro Four Thirds cameras it’s an excellent choice for portraits, sports or low-light photography but costing $899, or $975 including the lens hood, it’s not cheap. Money aside however this lens delivers good results for a Micro Four Thirds lens in all DxOMark Lens Metric Scores and with a Sharpness Score of 11P-Mpix it’s the sharpest lens available for this system. If you’re a convert to the smaller and lighter Micro Four Thirds cameras then the Olympus M.ZUIKO DIGITAL ED 75mm f/1.8 is excellent, but to put it into some context it’s not in the same league as other portrait lens and camera combinations. Take for example the Nikon 85mm f/1.8G mounted on a Nikon D3X lately reviewed. If the high cost of the Olympus M.ZUIKO DIGITAL ED 75mm f/1.8 is out of reach then Micro Four Thirds photographers will be pleased that the cheaper $400 Olympus M. Zuiko Digital ED 45mm f1.8 is a good alternative. As we’ve seen it’s not as sharp as the 75mm version and edge sharpness is inconsistent, but it represents better value if budgets are squeezed. That said if you’re after the best possible results and sharpness Micro Four Thirds has to offer and you’re prepared to pay for it the Olympus M.ZUIKO DIGITAL ED 75mm f/1.8 is the lens to buy. With an Overall DxOMark Score of 23 the Olympus M.ZUIKO DIGITAL ED 75mm f/1.8 is the best performing lens currently on our database.